Fate: Sunk on 11 January 1917 by shore-based Turkish artillery fire. HMS Ben-my-Chree (Manx: "Lady of My Heart") was a packet steamer and a Royal Navy seaplane carrier of the First World War. She had originally been built as a fast passenger ferry for the Isle of Man Steam Packet — the third to bear her name — in 1907  by Vickers for the England–Isle of Man route. To this day she holds the record crossing speed from Liverpool to Douglas for a steamship at under three hours. As HMS Ben-my-Chree she became part of aviation history when she was the platform for the first ship-launched airborne torpedo attack on a ship on 12 August 1915 . SS Ben-my-Chree was ordered in 1907 by the Isle of Man Steam Packet Company. She was built at the yards of Vickers, sons and Maxim Ltd in Barrow-in-Furness. The new ship would cost £112,000. She was powered by Vickers direct-drive turbine engines coupled to triple screws which moved here over the water at 24.2 knots, although in one sea trial she reached a speed of 24.6 Knots. The ship had a certificate for 2,549 passengers, and she had a crew of 119. The SS Ben-my-Chree engines burnt up to 95 tons of coal a day, which made her an expensive ship to run unless she had a full complement of passengers. This proved difficult to achieve by the Steam Packet Company, and so for nine months of the year the Ben-my-Chree found herself laid up. The SS Ben-my-Chree was chartered by the Royal Navy on 1 January 1915. On the 2 January 1915  the SS Ben-my-Chree began her transformation to HMS Ben-my-Chree at the shipyards of Cammell Laird in Birkenhead. She was to be converted to a seaplane carrier. Part of her superstructure was removed, aft of her second funnel, and a hanger was constructed. This was capable of housing six seaplanes , which were lifted in and out of the water by crane. There was also a 60-foot-long (18 m) flying-off platform forward . Her armaments consisted of four quick-firing 12-pounder guns, and two 3-pounder guns. Later in May 1916 more 12-pounder guns, and 2-pounder pom-poms, along with 3-pounder guns were added. She was originally based at Harwich, England, under the command of Commander Cecil L'Estrange Malone, where on 3 May she took part in an abortive air raid on Norddeich using a Sopwith Schneider to be launched from a trolley on the fore deck. The raid was abandoned because of thick fog, and the ships returned to harbour the following day. On 6 May, she was accidentally rammed by the destroyer Lennox in thick fog, although damage was slight. Another attempt at raiding Nordeich was made on 11 May, but was again abandoned because of several mishaps. During this raid, Ben-my-Chree attempted to launch her Schneider seaplane to attack an airship, but the engine failed to start. At the end of May 1915, she sailed for the Dardanelles, where her aircraft were mainly involved in spotting for naval artillery. The then Chief of the Royal Naval Air Service (RNAS), Colonel F.H. Sykes, ordered seaplanes to conduct exhaustive reconnaissance photography of the area. Naval Intelligence Officer Robert Erskine Childers oversaw these aerial photography missions, to great effect. These photographs would lead to one of her Short 184 seaplanes (piloted by Flight Commander Charles Humphrey Kingsman Edmonds) making the first ever aerial torpedo attack on 12 August, when she successfully launched a single 14 in (360 mm), 810 lb (370 kg) torpedo. Although the torpedo hit the Turkish ship and exploded, the vessel had been previously torpedoed by the British submarine E14 and beached. This was followed by a successful attack on 19 August against a 5,000 long tons (5,100 t) ship by Edmonds and Flight Lieutenant George Dacre. On 2 September, she participated in the rescue of Australian troops from the torpedoed HMT Southland off Lemnos. Following the abandonment of the Gallipoli Campaign, she was transferred to Port Said in Egypt. SS Uganda collided with her on 11 February 1916 and caused serious damage to Ben-my-Chree's bows, which were temporarily repaired. Permanent repairs in dry dock took from 13 March until 26 April. Cdr. Charles Samson replaced L'Estrange Malone as captain of the ship on 14 May. A few days later, Lieutenant William Wedgwood Benn, later Secretary of State for India (1929–1931), joined the ship as an observer. Over the next few months, she operated from Port Said and Aden provided artillery spotting aircraft for the bombardment of El Arish, reconnaissance around Jaffa and Ramleh and bombing raids. 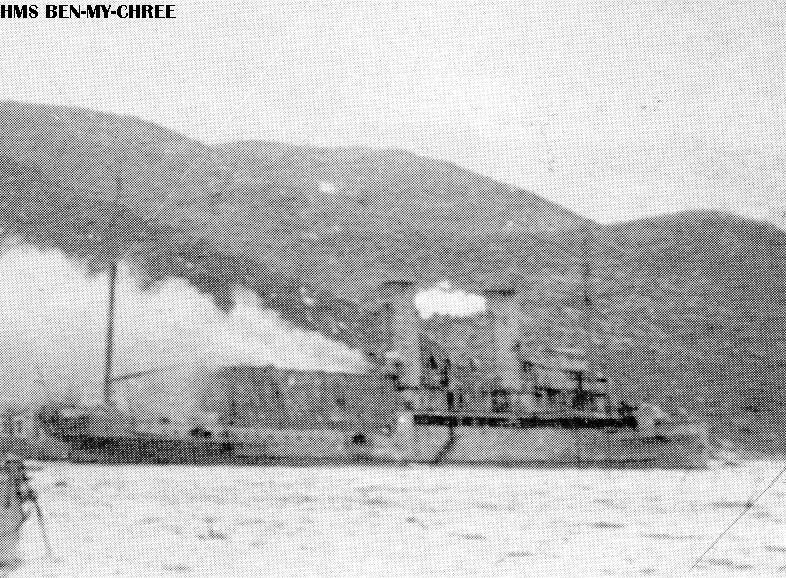 On 11 January 1917 HMS Ben-my-Chree was at anchor in a bay, off the island of Castellorizo, a Greek island on the southwest coast of Turkey . The ship was totally unaware that they were in range of a Turkish gun battery two miles away on the coast of mainland Turkey. The battery opened fire on the Ben-my-Chree, immediately holing her petrol store, which set the ship on fire. The ship's steering gear was also hit in the shelling, disabling her. This damage resulted in the captain being unable to move the ship out of range of the Turkish guns. The crew were ordered to abandon ship after half an hour of the bombardment. The crew used one of the three motor lifeboats to ferry the crew to safety; her other two lifeboats had been destroyed in the shelling. The complete complement of 250 men were saved, as the motor lifeboat was able to use the stricken Ben-my-Chree as a shield as they went ashore. The attack continued for five hours until the burnt-out hulk of the ship sank in the shallow water of the Bay. Later in the day the Captain and the Chief Engineer returned to the Ben-my-Chree, rescuing the ship's cat and dog, which had both survived the attack. The hulk of HMS Ben-my-Chree lay in the bay of the island until 1920. A salvage steamer called Vallette was sent to raise her. She was then towed to the port of Piraeus. There she was examined in detail, where it was decided she was beyond repair. Three years later, in 1923, she was broken up at Venice . After the success of their first turbine steamer Viking, the IOMSPC ordered Ben-my-Chree III from the same builders. She carried up to 2,550 passengers and was capable of 27 kn (31 mph; 50 km/h), although her service speed between Liverpool and Douglas was 24 kn (28 mph; 44 km/h); even then, she was an extremely costly ship to operate. ^ * Boyle, Andrew (1977). The Riddle Of Erskine Childers (A Biography). Hutchinson. ISBN 0-09-128490-2. "History of the ship, written in 1923". Isle of Man website. http://www.isle-of-man.com/manxnotebook/fulltext/mf1923/p07.htm. Retrieved 2007-05-20. "Manx Quarterly 1908 - Launch of the Ben-My-Chree". Isle of Man website. http://www.isle-of-man.com/manxnotebook/mquart/mq04328.htm. Retrieved 2007-05-20. Gari (Group Owner). "IsleofMan Yahoogroup (membership group)". Four extensive FILES under 'History' with hyperlinks to all available information and photographic sources at time of creation. http://groups.yahoo.com/group/IsleofMan/. Retrieved 2006-02-06. Hazegray.org. "Ben-my-Chree III and pics". Biography of Ben-my-Chree III with pics a) Burning and b) Converted for aircraft. http://www.hazegray.org/navhist/carriers/uk_sea.htm#benm. Retrieved 2006-02-06. Peter Hart. "Gallipoli: The Air War". The Joint Imperial War Museum/Australian War Memorial Battlefield Study Tour to Gallipoli, September 2000. http://www.iwm.org.uk/upload/package/2/gallipoli/pdf_files/GallipoliAirWar.pdf. Retrieved 2007-05-20. "World Aircraft Carriers List: RN Seaplane Carriers & Tenders". http://www.hazegray.org/navhist/carriers/uk_sea.htm. Retrieved 2007-05-20. "RAF 269 Squadron history 1914-1923, largely a chronology of Ben-My-Chree's activities". http://www.oca.269squadron.btinternet.co.uk/history/squadron_history/chronology/1914-1919.htm. Retrieved 2007-05-20. "'Ben-my-Chree, Isle of Man Packet Steamer and Seaplane Carrier', by Ian M Burns, the centenary history of the ship and her role in the development of naval aviation". http://www.crossandcockade.com/Store/shopexd.asp?id=255. Retrieved 2009-07-28. View of HMS Ben-my-Chree which was a seaplane carrier working in the locality of Dardanalles until the evacuation of Gallipoli, then moving on to the Egyptian coast. It was here off Castellorizo that she was bombarded and sunk by the Turks on 11 January 1917. Photo of HMS Ben-My-Chree burning after being hit by shorebased artillery.